Is anyone going to drink tonight when the Nats clinch? I don't really want to but I'm getting the feeling that I won't be able to help myself. Got a bottle of champagne at the grocery store earlier. Drinking some beers during game. East or West Oakton malt? South Sperryville malt, chilled by the outdoor porch night air. Why can't we hit the fork lift operator? I still can't get over the fact that SF is an adult who drinks. Harang has settled in. This is not good. The bandwagon fans are back. That was some severe jammage on Harper. But no call from Bob, does he have a touch of the virus also? C'mon Bob, I was getting thirsty there. Why would you want to hit him? He's a working man who's just trying to feed his family. Missed the last few games. Baby boy delivered last night. Home run call you mean? I could be wrong but wasn't Asdrubal the guy in Cleveland. And he's ninth best here when Zimmerman gets back? Congrats! What's his name, Bryce? Tanner? Ian? FP. Not an acronym, but literally just "FP." Still working on names. You know I never thought about Nats player names. Duh. No, when Bob calls "jammage", you drink. "Severe jammage", double up. And he knows we follow that little thing he does. I wonder if he's pissed at us. So the Nationals latest promotion is $5 for One Beer Night? 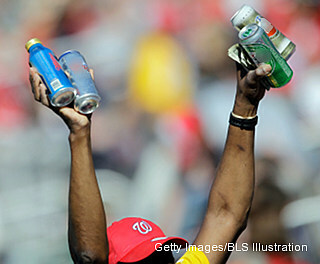 Since they think people would willingly pay $30 for one 6-pack, what is the regular price for one beer at Nationals Park? You are in Canada so the first two possibilities have to be Terrance and Phillip.